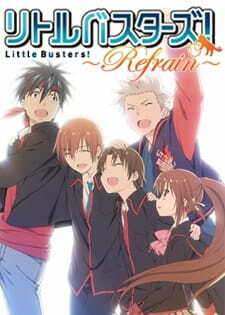 Little Busters: Refrain, as you would expect from a ‘second season’ to an Anime follows the events of the first season by developing characters who were largely overlooked in the past. It is one of very few anime where the relationships between the characters feel genuine rather than forced or manufactured. As a series that I think is heavily versed in the theme of friendship, Refrain does a magnificent job at that. I can go on and on about the characters and the various development each one seemed to have this season, however, I won’t be doing that. Instead, I will be focusing on what I thought were the highlights. I thought Kyousuke’s development this season was also amazing. Refrain shows there is a far deeper reason for why everyone respects him so much. It is more than just his charisma. He cares about his friends more than anyone else and will go to any lengths to protect them from harm. Even if it requires him to play the role of a villain. It is easy to be frustrated by Kyousuke’s actions, but once all the pieces start clicking together at the end, you can’t help but respect the poor guy. He’s a deeply flawed person, and that’s the way it should be. That is to speak nothing of how powerful Kyousuke’s episode is. Or all the subtle details are hidden in the first season, or even how it gives meaning to all the alleged dei ex machina within Kud’s and Mio’s routes. Little Busters is Jun Maeda’s masterpiece, and while not everybody may appreciate his style of storytelling, there is almost nothing to criticize about his work on Little Busters. Even if the anime only captured a tiny fraction of the visual novel’s charm, I still believe it would be a satisfying experience. J.C. Staff’s adaptation isn’t fully there– but it comes close. The artwork has been noticeably improved over the previous season, though. A surprising amount of effort was put into the first episode, and J.C. Staff has worked to eliminate most of the bizarre, off-model faces that were so prevalent before. There are still occasional scenes where the animation quality dips but it is nowhere near as egregious as it used to be. Refrain makes near-perfect use of its soundtrack. “Boys Don’t Cry” (Kyousuke’s theme) is a subtle track that does not seem to carry much significance at first, but eventually evolves into an emotional track in the story. You may also know “Haruka Kanata”, the farewell song of the series which I thought brought with it a tsunami of emotion. Who is to forget about “Song for Friends” which achieves much of the same impact as the previous two. All three are really good and are beautifully utilized.